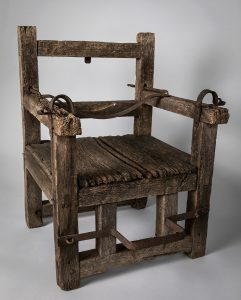 Ducking chair, English, traditional 17th century, Jamestown-Yorktown Foundation Collection. 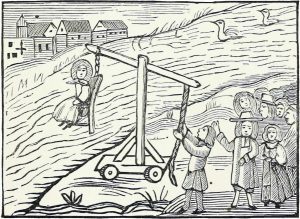 “Let me go, Let me go, by God’s help I’ll sin no more!” cried Betsey Tucker after she was ducked underwater, five times at 30 seconds each, for disorderly speech in Hungar’s Parish on Virginia’s Eastern Shore in 1634. Betsey was ducked in a chair similar to the one recently purchased by the Jamestown-Yorktown Foundation and on exhibit in “TENACITY: Women in Jamestown and Early Virginia” at Jamestown Settlement. Since most early Virginia women had no legal standing, they often used the power of their voices to speak out against male authority over them and to express their opinions. As the 17th-century Virginia colony became more stable, men created laws to strengthen their control over their wives, including their wives’ tongues. Initially, local officials charged men a fine to pay for their wife’s behavior towards another colonist. But to alleviate husbands from this duty, in 1662 a law expressly for the curbing of “brabbling women” established that: Whereas oftentimes many brabling women often slander and scandalize their neighbours for which their poore husbands are often brought into chargeable and vexatious suites, and cast in greate damages . . . after judgment passed for the damages the women shalbe punished by ducking . . . (“Statutes at Large . . . A Collection of the Laws of Virginia”, 1662). To ensure that this could be effected, the General Assembly also stipulated that “in every county, the court . . . sett up a pillory, a pair of stocks, and a whipping post, neere the courthouse, and a ducking-stoole.” (“Statutes . . . of Virginia”, 1661-2). 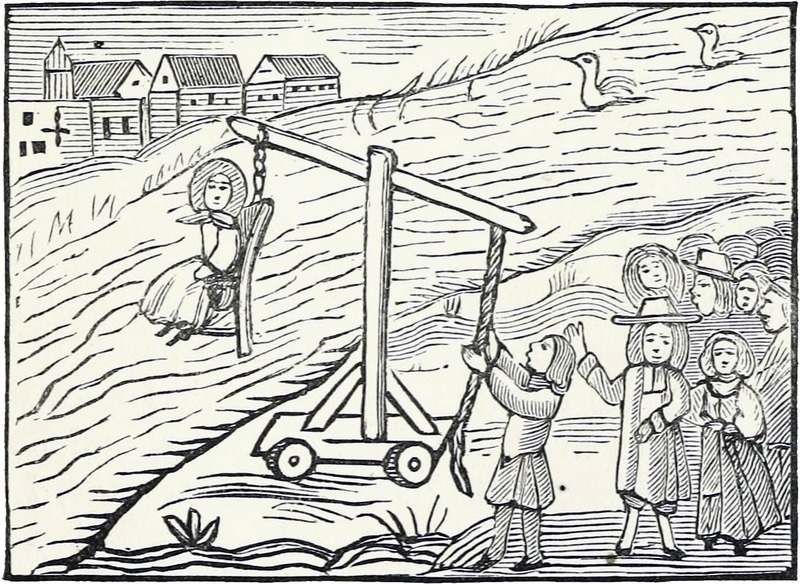 Almost 30 years before the General Assembly enacted these laws, however, officials in Hungar’s Parish ducked Betsey Tucker, enacting a punishment commonly used in England where both men and women could be shamed in this fashion. Betsey’s case did not even reach local courts; the parish minister had warned her three times to stop her scolding and nasty language. When she did not, the parish involved the local magistrates who ordered her to be publicly ducked. Old Woman Draught at Ratcliffe Hightway from “A Strange and Wonderful Relation of the Old Woman who was Drowned at Ratliffe Highway” (c. 1780). The chair purchased by the Jamestown-Yorktown Foundation differs a bit from the one used to duck Betsey Turner. It more closely resembles the one used for the “Old Woman . . . at Ratcliffe Highway.” Made of white oak, the chair is recorded as being in Stratford-upon-Avon in the early 20th century. Documentation before that time is lost, so it is not known when the chair was originally made. Nevertheless, the chair reflects the traditional form used for centuries in the punishment of women. The chair, which reflects early 19th-century repairs, was conserved and now appears in the special exhibition, “TENACITY: Women in Jamestown and Early Virginia” as one way to depict aspects of women’s lives in 17th-century Virginia. After “TENACITY” closes January 5, 2020, the chair will hold a permanent place in a new section of the Jamestown Settlement galleries depicting the lives and stories of women in early Virginia.